My research group focuses on the tectonics of converge﻿nt margins and the evolution of the continental lithosphere. Research goals are generally centered around identifying and resolving interactions between orogenic magmatism, crustal deformation, sedimentation, and lithospheric dynamics in C﻿ordillera﻿n and collisional orogenic systems. Most research projects are field-based, but we also employ lab-based analytical, experimental, and numerical methods. Please visit the research page to learn more about ongoing research. October 2018: Dr. Ellen Currano (paleobotanist at UWyo) and I received a small grant to work on the uplift timing of the Big Horn Mountains and potential paleogeographic-paleoclimatic effects on plant populations in the early Cenozoic. September 2018: I will be giving the University of Wyoming Distinguished Lecture Series talk on Sept. 17, entitled, "The radiogenic isotopic record of Cordilleran magmatism: implications for orogenic cyclicity." October 2017: GSA in Seattle: I'll be co-teaching the short-course , "U-Pb Geochronology, O and Hf Isotopes, and Trace Element Geochemistry Applied to Detrital Minerals" on Saturday with George Gehrels and John Valley. My part focuses on trace element geochemistry of accessory minerals, zircon in particular. On Sunday afternoon, I will be giving a talk on an Eocene magmatic event in the Pamir and correlative events in the Tibetan Plateau that I'll argue are related to localized mantle delamination or mantle drips in response to initial India-Asia collision. Come check it out. August 2017: Fangyang Hu has a new paper out in Scientific Reports, "Quantifying crustal thickness in continental collisional belts: global perspective and a geologic application​," that I am a co-author on. July 2017: Jamie Worthington has a new paper out in Tectonics, "Birth, life, and demise of the Andean–syn-collisional Gissar arc: Late Paleozoic tectono-magmatic-metamorphic evolution of the southwestern Tian Shan, Tajikistan," that I am a co-author on. 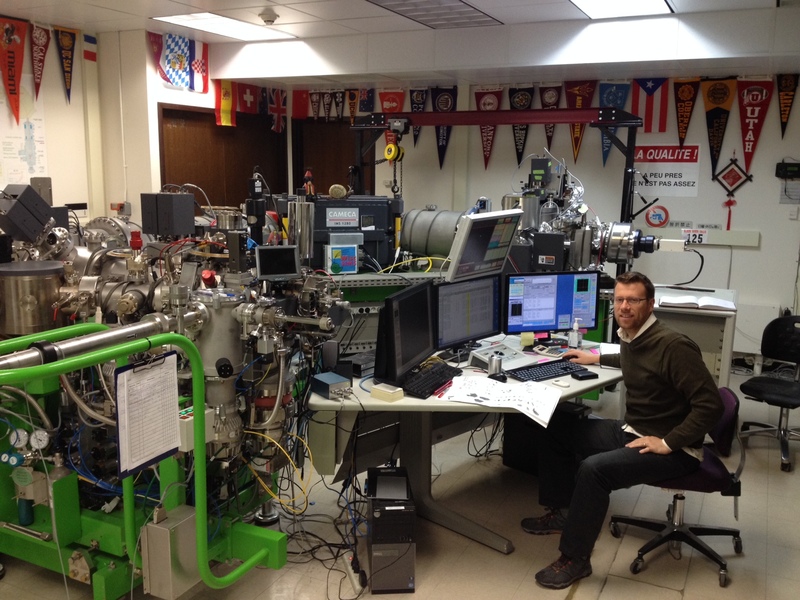 January 2017: I'm in Wisconsin this week (Jan. 23-26), working in Dr. John Valley's lab analyzing oxygen isotopes in zircon from magmatic rocks in the Southern U.S. Cordillera. Here is a picture of me with the SIMS.